On the Nanaimo campus, Facilities Services provides security services 24 hours a day. Facilities Services employees, first aid attendants, and external emergency services will be dispatched as determined from your call. 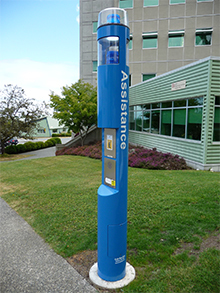 As Vancouver Island University security or first aid employees can respond to a situation much faster and with less difficulty than external services, it is important that all emergencies be reported to the Vancouver Island University Emergency Line at Local 6600 or 250-740-6600.
or use a blue Assistance Phone. Safe Walk is a Campus Security program. This will provide escorted walks on the Nanaimo campus. By contacting the dispatcher via the number listed below, you will be accompanied on your walk on campus or to your car by Security. The patrollers are equipped with two-way radios, safety vests and flashlights. Practice the principle of "safety in numbers" and contact the Safe Walk Program at Local 6600 or from an external phone, dial 250-740-6600 for assistance.